The Gaza Strip, which is dominated by the Islamist Hamas faction, has experienced three wars with neighbouring Israel in the past 11 years. There are few recreational activities for women in the densely-populated enclave of two million people, which is under a blockade imposed by Israel and Egypt and has the highest unemployment rate on earth. Amal Khayal, who teaches the class in a makeshift gym and also heads women's activities for Italian charity Cooperazione Internazionale Sud Sud (CISS), said the project was aimed at training some 30 women to teach. 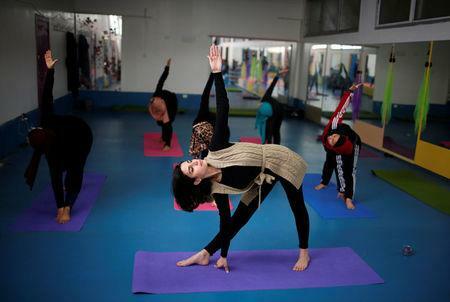 "Everyone in Gaza, specially women, needs yoga because we live in a tough place. There are no entertainment facilities where we can unload our depressions which come in addition to our daily life issues," said Amina Al-Zraiay, a sports teacher and occupational therapist.